Book available from www.amazon.com List price $18.99. 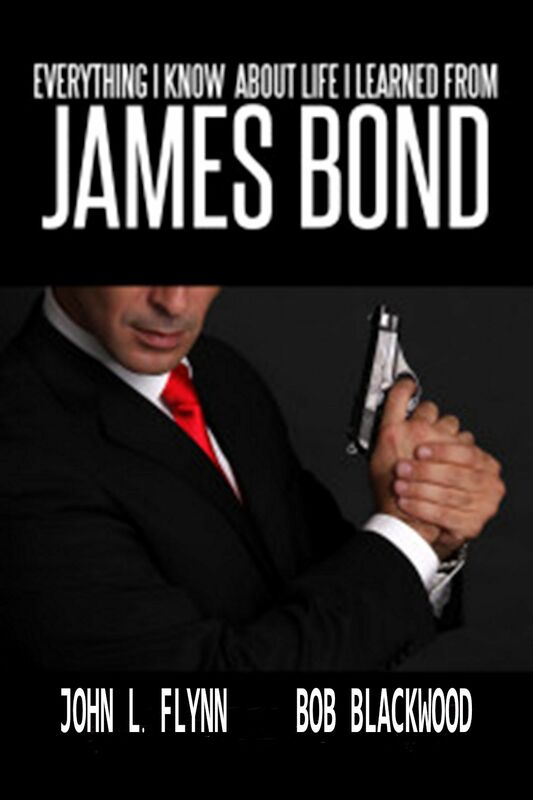 Everything I Know About Life I Learned From James Bond – The ultimate Bond guide! If you want to know all the little details on the making of the Bond movies—the villains, the Bonds or his girls—this is the book to have on your coffee table. After reading it, you will want to watch every movie from Dr. No to the one just coming out, Spectre, just so you can pick out the facts. It is addicting…and each Bond has been so hot! Bond never ages. Who has not heard the words, “Bond, James Bond” or “Martini shaken, not stirred”? Most of the world knows of James Bond and/or has seen one or all of his movies. Some of us are addicted; men mimic him and women dream of being a ‘Bond girl.’ From Sean Connery to Daniel Craig, each one has given us thrills and glimpses of the secret world of spies. Saving us all from certain doom dished-out by fiends such as Blofeld or Goldfinger, and just recently Silva, Bond risks all and still gets the girl(s). We line-up at the theatres to see him larger-than-life, hanging on his every word and gesture. Italian American Gangsters in Trend Setting Films and Television Shows. 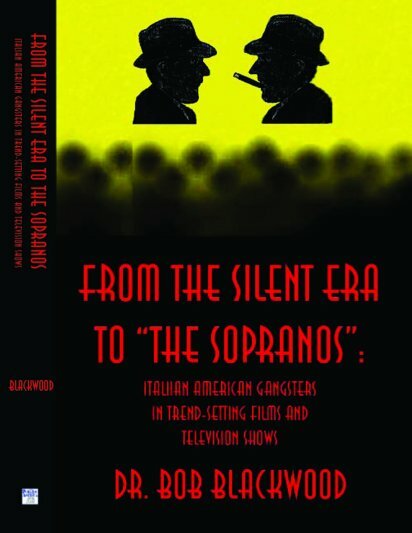 From the Silent Era to “The Sopranos” contains critical commentary on the major Italian American gangster films and TV shows and biographical data on the actors who starred from “The Black Hand” (1906) to “The Sopranos” (1999-2005). 92 films and seven TV series are analyzed in this nonfiction analysis. Early 1930’s sound films include “Little Caesar,” “Scarface,” plus from the 1940’s—“Kiss of Death,” “Key Largo,” from the 1950’s—“Guys and Dolls” and “Some Like It Hot,” and from the1960’s—“The St. Valentine’s Day Massacre,” and “The Brotherhood” and many others Special chapters for Martin Scorsese’s films (“Mean Streets,” “Goodfellas,” “Casino”) and Francis Ford Coppola’s films (“The Godfather” trilogy, “The Cotton Club”). Many contemporary films include “Thief,” “Prizzi’s Honor,” “Miller’s Crossing,” “Married to the Mob,” “True Romance,” “Bugsy,” “Out for Justice,” “Bullets Over Broadway,” “Get Shorty,” “Gotti,” “Donnie Brasco,” “Analyze This,” and “A History of Violence.” TV shows include “The Untouchables,” “Crime Story,” “WiseGuy” and “The Sopranos” with an episode guide. Dr. Bob Blackwood from Wright College, Chicago, taught film study, photography and literature. His reviews appeared in The Chicago Seed, La Parola del Popolo and the Leader Newspapers. He has worked as a reporter for Fra Noi (Chicagoland’s Italian American Voice) from 1989 - 2007. He currently writes movie reviews for The Columbia River Reader. 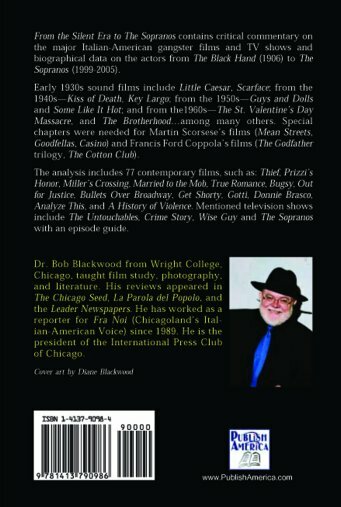 Dr. Bob has reviewed books on films and filmmakers since 1968 for Choice, the magazine of the American Library Association. He was the president of the International Press Club of Chicago from 2005-2008. 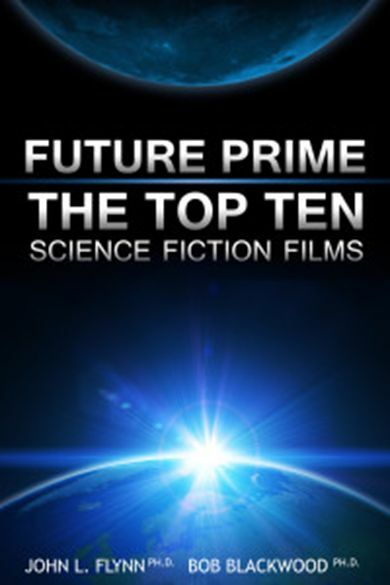 Future Prime: Top Ten Science Fiction Films – What’s your favorite science fiction film? At the start of the new millennium, fans who attended science fiction conventions persuaded Flynn and Blackwood—aka “The Film Doctors”—to conduct a survey of the Top Ten Science Films of the 20th Century. They then embarked on a ten-year odyssey to gather thousands of fan votes. The result: a list of science fiction films that probably contains at least one of your favorites. Each film was considered from its inception, to the pre-production period, through production and finally the audience’s reaction, reviews, critical responses and interviews with directors, producers and stars of the movies. This nonfiction work will enlighten you while stimulating your memory of some wonderful films.